Darlin' came to us in milk in the spring of 2015, and we were thrilled to add her to the herd. 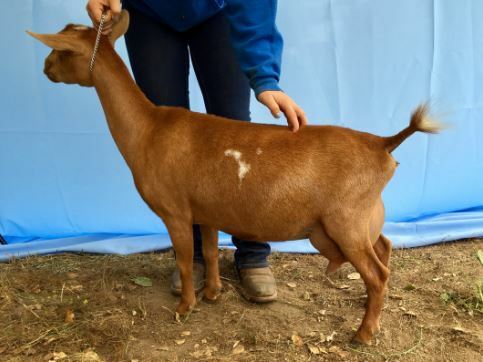 Darlin' hails from Algedi royalty on 3/4 of her pedigree, she is even a granddaughter of the infamous SGCH Algedi Farm DJ Honey Dew 5*M EEEE 91. 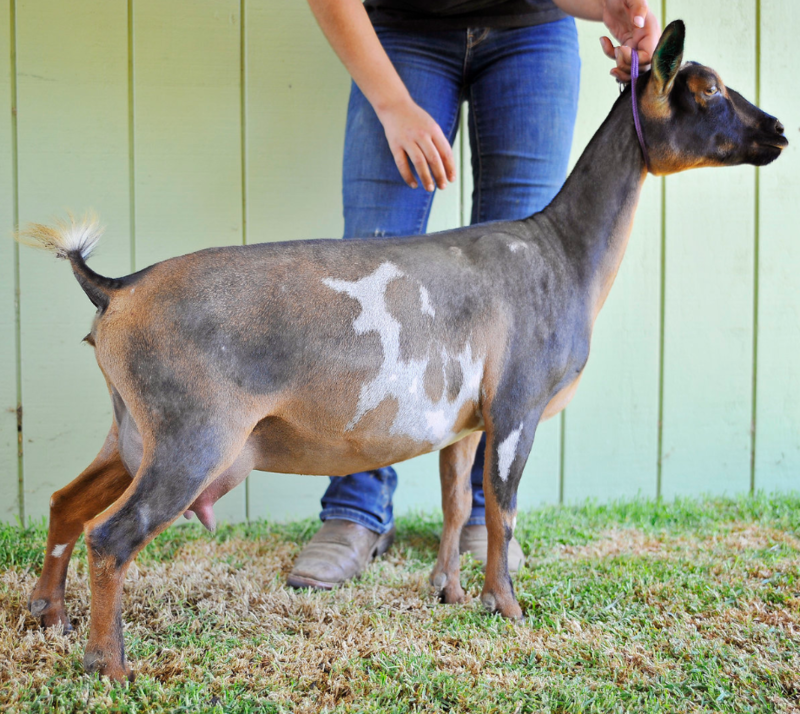 Her pedigree predicts not only excellence in conformation, but milk as well. 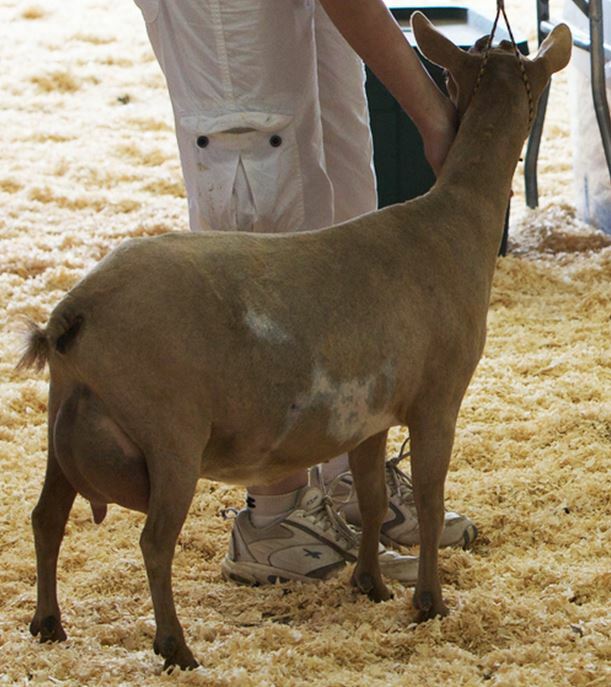 Darlin' is a long bodied doe with excellent body capacity standing on strong legs. 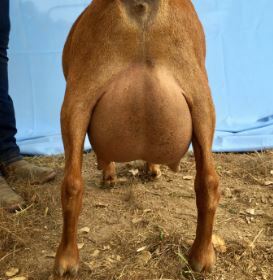 Her udder is well attached and capacious with good fore-udder extension. She has received excellent marks in rear udder height and arch and scored an "E" in Body, Dairy Strength and Mammary on her 2017 LA. Darlin milked almost 1,500 pounds during her 2016 lactation, as well as earning her Superior Genetics designation during the same year and securing the #2 ADGA Top Ten Breed Leader for Milk production. 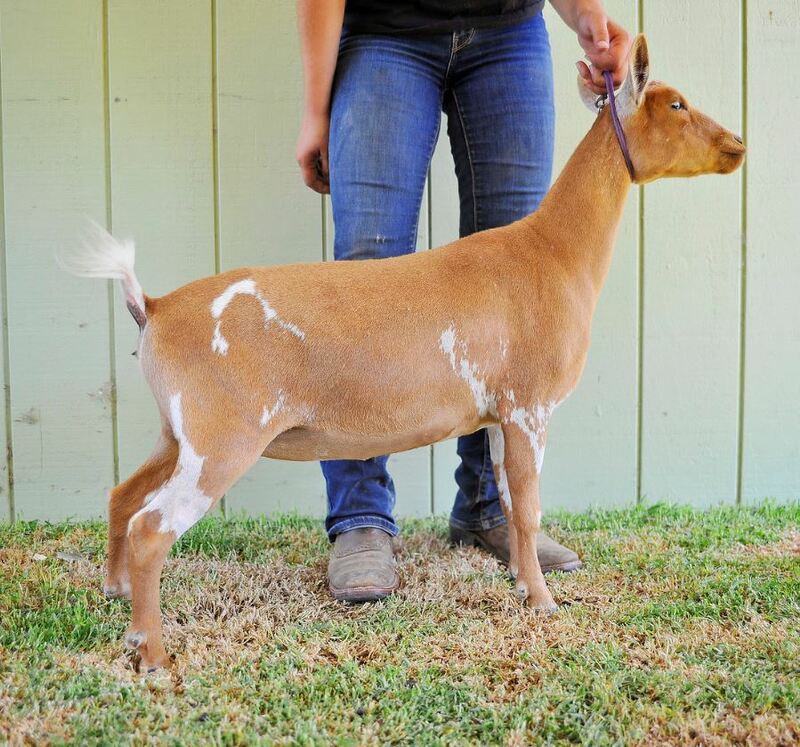 In 2017 her LA score truly reflected what a beautiful doe she is, she earned a VEEE 90 at 4 years and 4 months old! Darlin is well on pace to milk over 1,400 pounds during her 2017 lactation and her two-year-old first freshening daughter will milk just shy of 1,300 pounds. These are incredibly milky genetics! Darlin' milked 1,491 pounds of milk during her 2016 lactation. That's an average of 4.6 pounds a day for 323 days! Darlin' kidded with sextuplets in 2017, five does and one buck. Two does have been retained. Darlin' earned VEEE 90 as a four year old, forth freshener at the 2017 LA, with an E in Mammory! August 2017 she was awarded ADGA's Top Ten Breed Leader award! Placing second for milk volume and fifth for protein. Darlin's 2014 First Freshening Daughter has milked 1,160 pounds in 263 days. She will be kept in milk all 305 days! ​At 61 days fresh Darlin milked 7.1 pounds during her second milk test of the season. Septuplets 12 days early. Only 2 does survived. Quints - all healthy and thriving! All Sold. At 305 days she ended her 2017 lactation with a 4.6 per day average! She start her first test in 2018 with 6.9 pounds and then topped that at 61 days fresh with a 7.1 pound milk out. In her 125 days in milk for 2018 lactation Darlin averaged 6.3 pounds a day! She just keeps getting more productive each year! *2018 Milk Test is in progress, we will update these records monthly to reflect the most current data. As a First Freshener Dew A Lil Dance milked 940 pounds in 314 days. That's a pretty milky little doe for a first freshener! Belle is quickly following in her dams footsteps. As a two-year-old first freshener she milked 1293 pounds...as a First Freshener!! These genetics pass on such a will to milk...it's incredible what we are seeing generation after generation. We think she has a ton of potential and can't wait to watch her fully mature. We are so thrilled with our very first daughter to freshen from Castle Rock Red Hot Saracha. At just 15 months old and just 11 days fresh, Hidden Hills RHS Kiss & Tell earned an V+VV 86 on Linear Appraisals. We were hoping to see some improvements on her dams udder confirmation and Kiss & Tell does not disappoint. 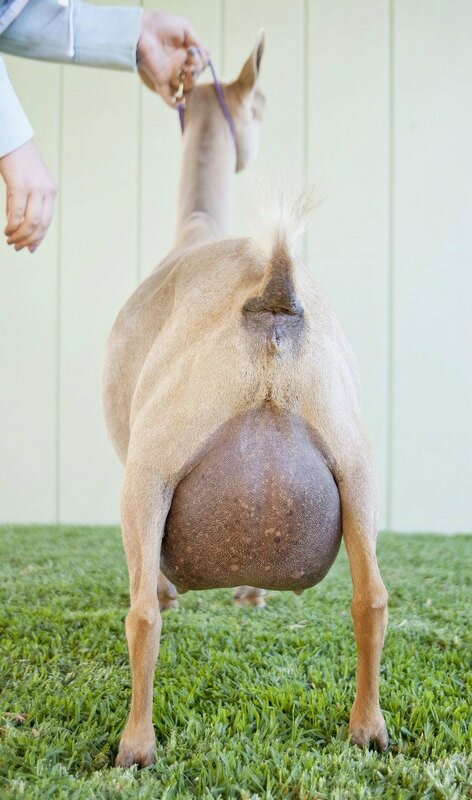 For such a young doe her udder capacity already looks impressive. Because she kidded so late in the season she will have a shorter than usual lactation this year, but I am so excited to have her on a long lactation next year and to see what this young girl can do.